As an employer, job interviews are an opportunity to grow your business by finding the best people with the perfect skill set. They can also be incredibly stressful interactions with individuals whom you know very little about other than their name, employment history and education. It’s true: The best interviews tend to look less like an interview and more like an insightful conversation between two like minds interested in working together. The worst interviews can seem more like prison interrogations that simply can’t end fast enough. Prospective employers and job applicants each arrive with their preconceived notions about how the interview should go, but it’s ultimately up to the interviewer to set the tone and create a safe space where applicants feel they are being treated fairly. With that in mind, here are just a few tips to help your next interview go as smoothly (and legally) as possible. Nothing makes an interview go off the rails faster than a misunderstanding about what the prospective job entails. Even if an applicant’s CV suggests he has the skills necessary to do it, a vague or boilerplate job listing can create unintended confusion on both sides of the table. You might simply assume that the applicant knows what his day-to-day work will entail, while the applicant might have completely the wrong idea. This can turn an interview into an unproductive game of “Who’s On First” that results in nothing but wasted time. Avoid this kind of situation by creating an attractive, detailed job listing that covers all of the bases. Find a good model to work from, like LifeLock’s Career Center. Not only does this site offer an in-depth description of the responsibilities for each available position, it also takes the time to discuss employee perks and work lifestyle. Having all of this information available upfront means the actual interview can focus on whether the applicant is a good fit — not just whether he understands the job he applied for. Interviews should be cordial and professional, but never personal. Federal and state law protects applicants from discrimination based on age, race, gender and sexual orientation, so there’s absolutely no reason to inquire in the first place. You also want to avoid so called “side-door” questions that can unintentionally produce answers that are personal in nature and could be seen as discriminatory. These include asking someone if she’s married or pregnant, or inquiring about his place of birth. It can be tempting to ask a personal question as a kind of icebreaker, but stick with small talk. Did you have trouble finding the place? or How’s your week going? These will let you move more quickly to the meat of the interview, while also completely avoiding a situation in which a candidate who was simply underqualified feels that he’s been discriminated against. 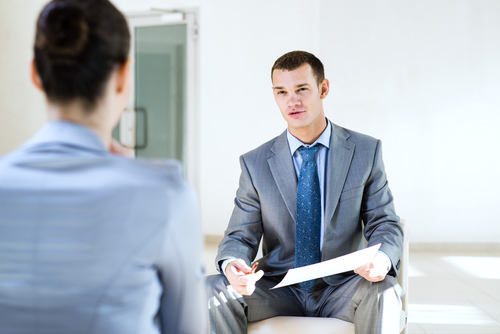 An interview should involve an equal exchange of information between both sides. As the interviewer, you should be prepared to offer a brief history of your company while highlighting a few key goals that drive business. You might also offer a bit of insight about how the position came to be available. Then you want to ask the right questions to get the applicant talking. Avoid asking a series of yes/no questions. This isn’t a quiz. You want the question to be open ended so that you can get an idea of how the applicant thinks. If you own a web development company, don’t ask Do you know how you use HTML? Say, Talk a little bit about your previous experience with HTML. From his response, you’re going to be able to gauge exactly how well the applicant knows HTML (and really, what applicant would say no). Also, avoid unusual questions that are meant to get applicants thinking outside the box, like If you were a luxury car, what kind would you be? These tend to distract and derail the interview process, and they can even have a subtly discriminatory effect. What if your applicant has never been in a luxury car?